By Craig | October 27, 2018 | This post may contain affiliate links, which means we may receive a small commission, at no cost to you, if you make a purchase through a link. Read our Disclosure. It was a dream of ours to visit New England on a fall road trip. When we previously lived in North Carolina we never made it further north than New York and now that we are back living in Raleigh, a New England road trip was high on our list. 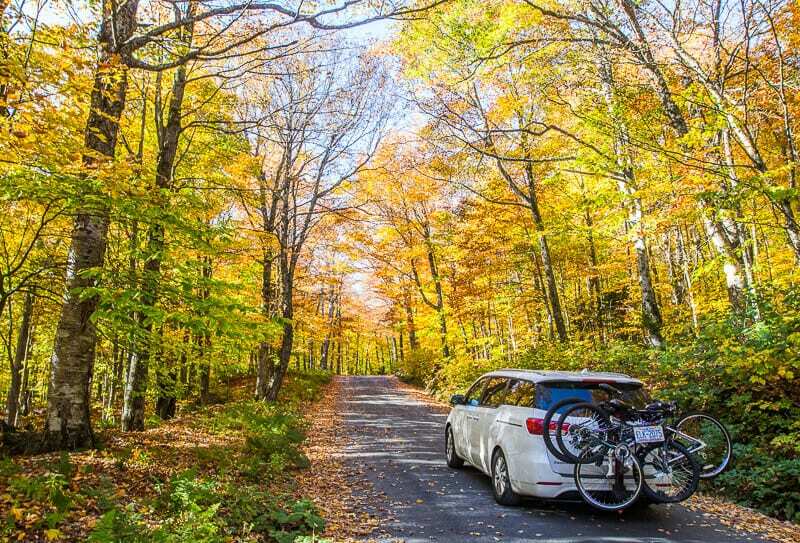 We love road trips, and Vermont in the fall is one of the best places to visit in New England, and the best way to experience it is by car. Unfortunately, in 2017 the weather was unseasonably warm which meant the leaves weren’t popping with color like they have in the past, but for us Aussies, it was still better than anything we’ve ever seen. All up we spent a week exploring Vermont. 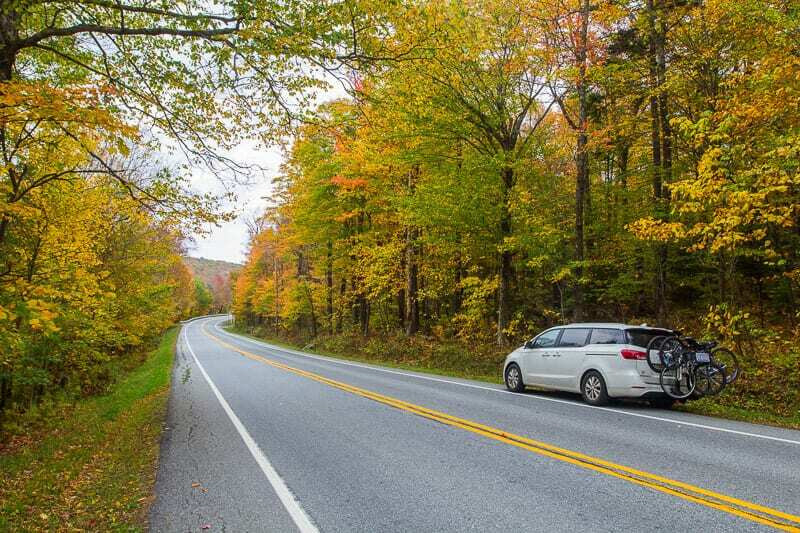 Our suggestions below is not an exhaustive list of the best places to visit in Vermont, but the places we recommend from our Vermont road trip. We’re hoping to revisit Vermont again in another season and explore more. Our introduction to New England was the quaint town of Manchester VT in the valleys of the Green Mountain National Forest. We stayed in Manchester Vermont for three nights and did our best to chase the leaves all over the Green Mountain region, using Manchester our a base to explore southern Vermont. 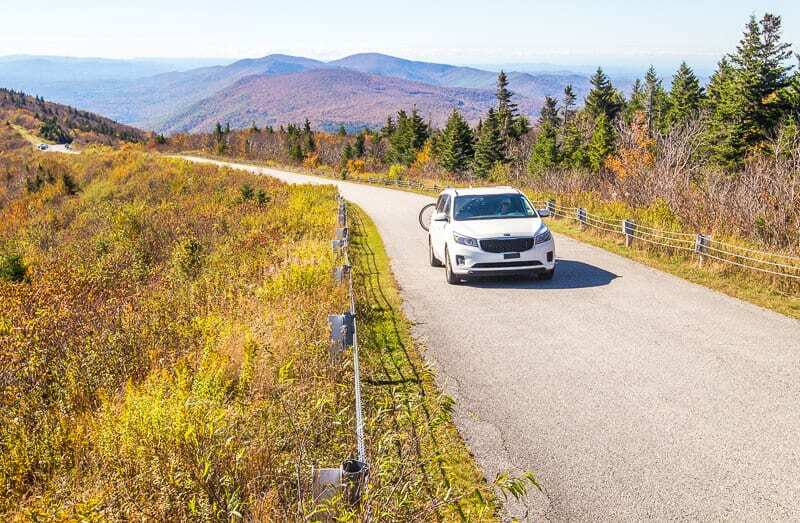 One of the most popular things to do in Vermont is the Mount Equinox Skyline Drive! The drive is the longest privately owned paved toll road in the USA at 5.2 miles long, and the elevation increases to 3,235 feet. We kind of messed up on this drive by doing it in the middle of the day when the lighting is at it’s harshest, so my tip is to do this in the morning or later in the afternoon for sunset. As mentioned the fall colors weren’t as spectacular as we hoped, it was more brown in color, and the auto toll road is a little expensive as well. But I think if you went at the right time of the day, and in the warmer months and had more time to take some walks and have a picnic it would be a better experience. 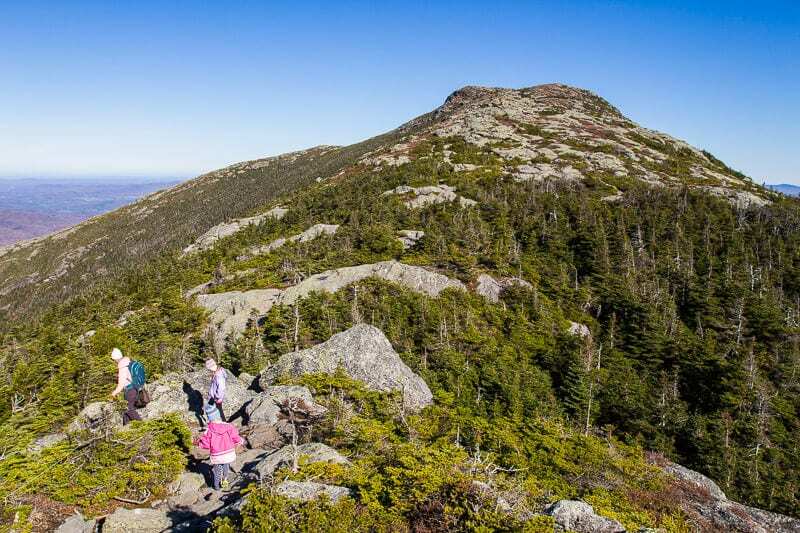 There are a lot of hiking trails in the Green Mountain National Forest. 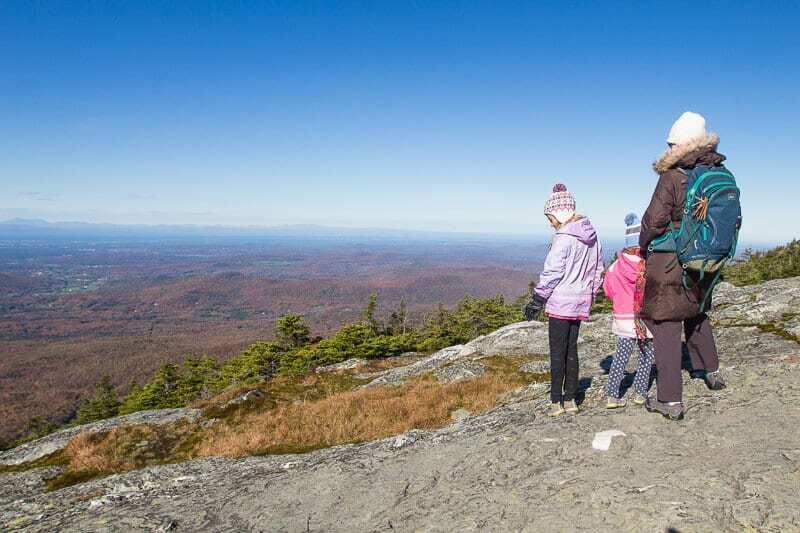 We only had time for one hike so we chose to do the Prospect Rock Walk as it seemed family-friendly and offered good views over the Manchester Valley. It is an uphill 3.1 mile return walk, but going up was fairly gentle depending upon your fitness level, but our kids aged 10 and 6 managed it no problems. The trail winds along a mountain brook before departing into birch-beech forest on a wide and open logging path, and criss-crosses the Appalachian Trail and Long Trails. Once at Prospect Rock, you get beautiful views of the Manchester Valley with Mount Equinox to the west. Manchester VT is a lovely town to explore on foot or bicycle. 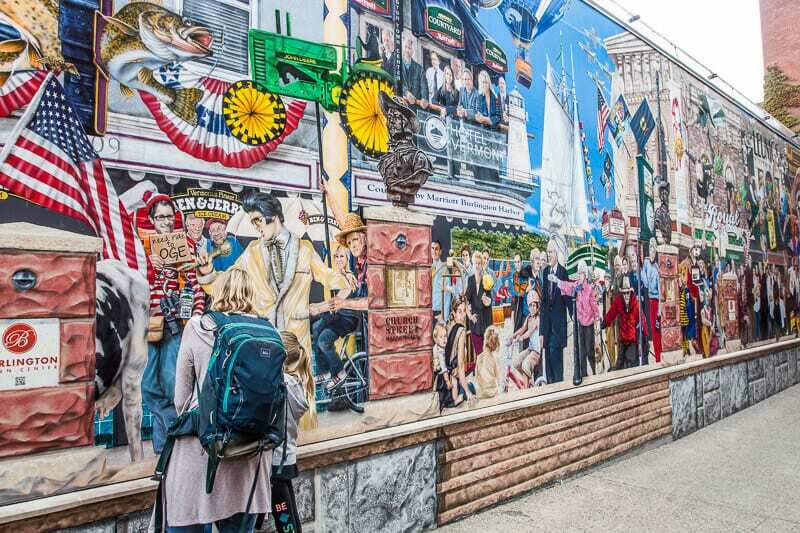 The charming Main Street splits Manchester into two sections, and we began in Manchester Village which is where you’ll find many of the white columned mansions and Victorian-era inns. There is the gorgeous church and in the fall you’ll get golden pops framing the spire. The popular and luxurious Equinox Hotel, built in 1769, is the centerpiece of the village. Manchester Center is where the more unpretentious stores are – one of the most famous being the Northshire Bookstore. There are a few arts and crafts shops and restaurants here as well. For breakfast the cafe Up 4 Breakfast is a popular spot – our kids loved their pancakes. One of the highlights of visiting Manchester VT was our stay in a cozy cottage at Wilburton Inn, an historic inn on a 30-Acre hilltop estate. The property was built in 1902, but has been independently owned for 30 years by the Levis family. 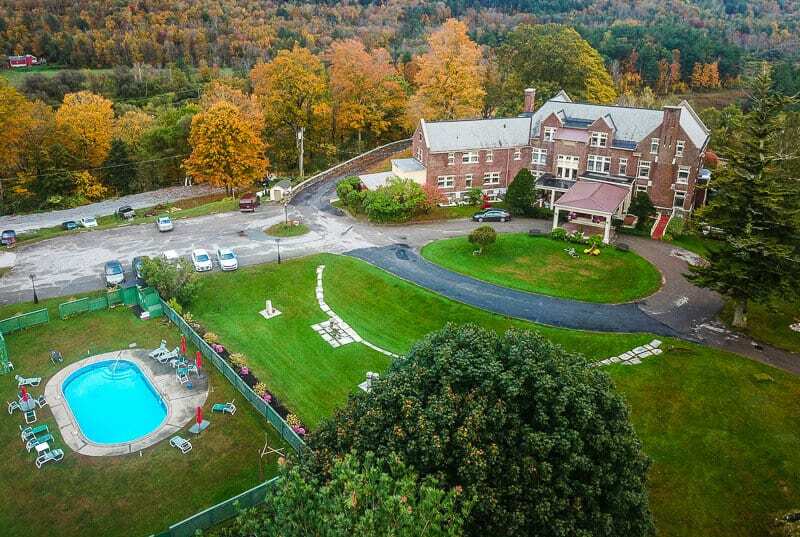 There is plenty to do on the beautifully maintained 30 acres of property – biking and walking paths as well as tennis courts and swimming pool (in season). The Wilburton has inn rooms, suites and vacation villas ranging from 2-bedroom cottages to a 15 bedroom mansion. 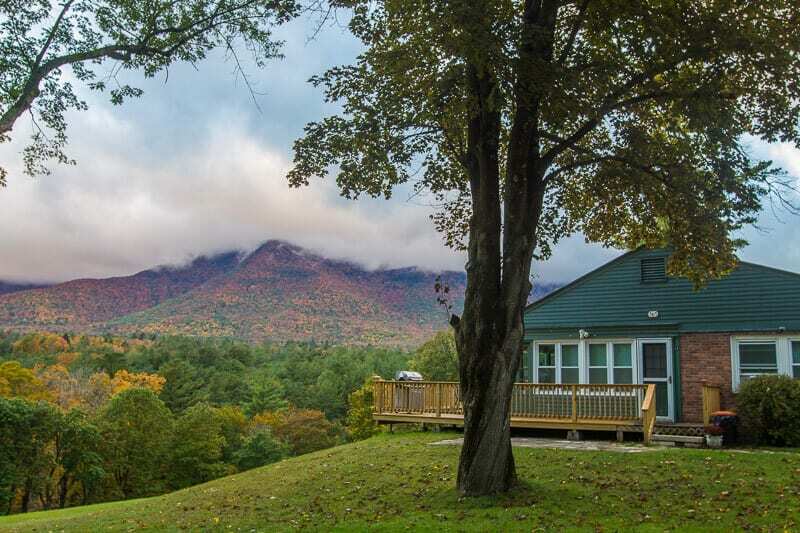 We stayed in the Inn keeper’s cottage with unobstructed views of the Green Mountains. The cottage was first built for the original innkeepers. 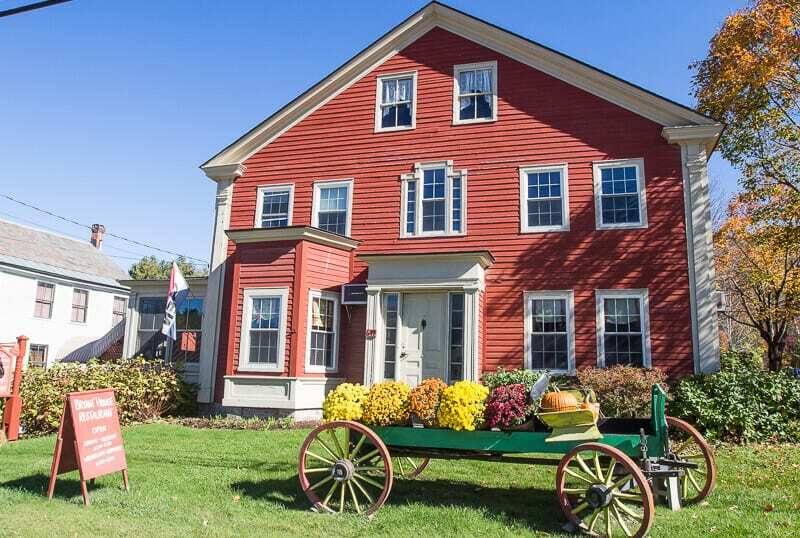 It’s a two bed, two bath cottage that can sleep up to 6 people making it a great places to stay in Vermont for families. 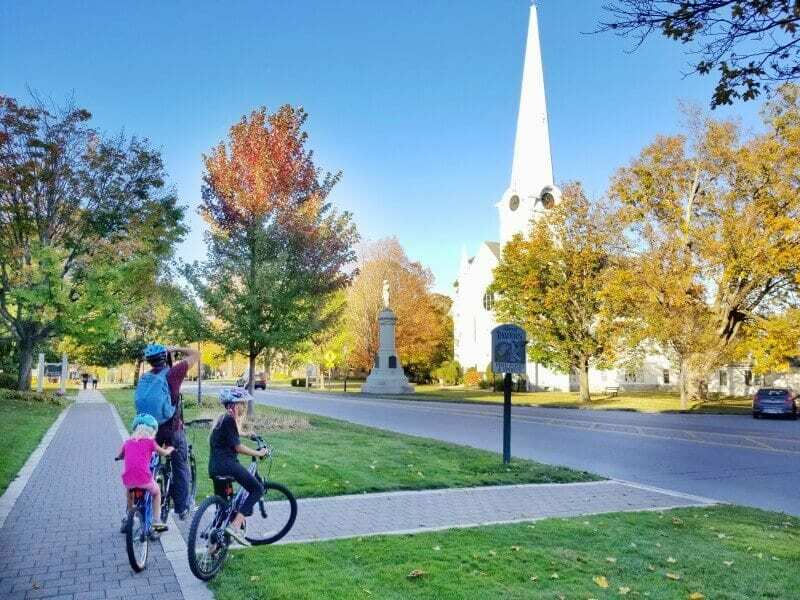 Downtown Bennington is only a 30-minute drive from Manchester and has the quintessential Main Street feel with shops, sidewalk cafés, art galleries, and museums. There’s also a Riverwalk, farmers market, and a thriving community center with a rich history, stunning architecture, and small town hospitality. We didn’t spend long in downtown, instead exploring the local area. This is one of the best places to visit in Vermont for a bit of Revolutionary War history. 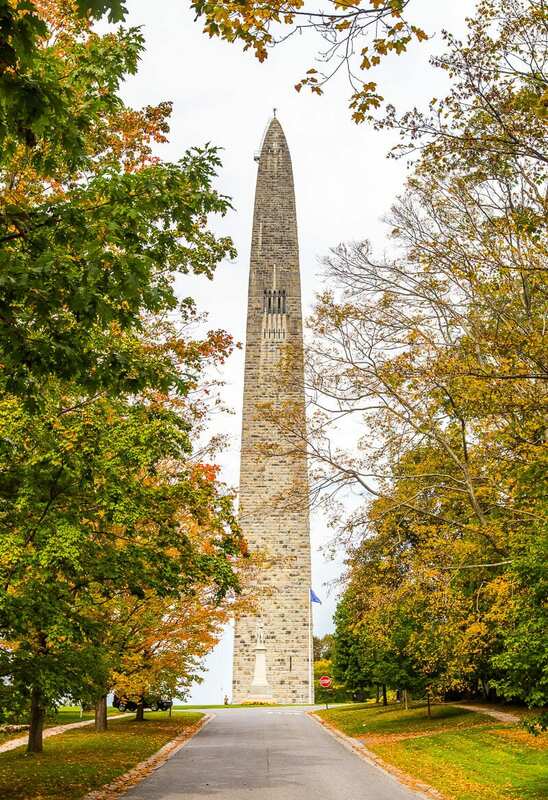 The Bennington Monument was built to commemorate the Battle of Bennington, which occurred on August 16, 1777 and is considered to be the turning point in the Revolutionary War. For $5 you can take the elevator to the top of the Monument (306 ft high) which offers a pretty birds eye view of the Bennington area, including where the battle was fought and all the way to New York state and Massachusetts. This monument was definitely one of the most interesting things to see in Vermont. Photographs of covered bridges in Vermont have always inspired me to take a New England road trip. 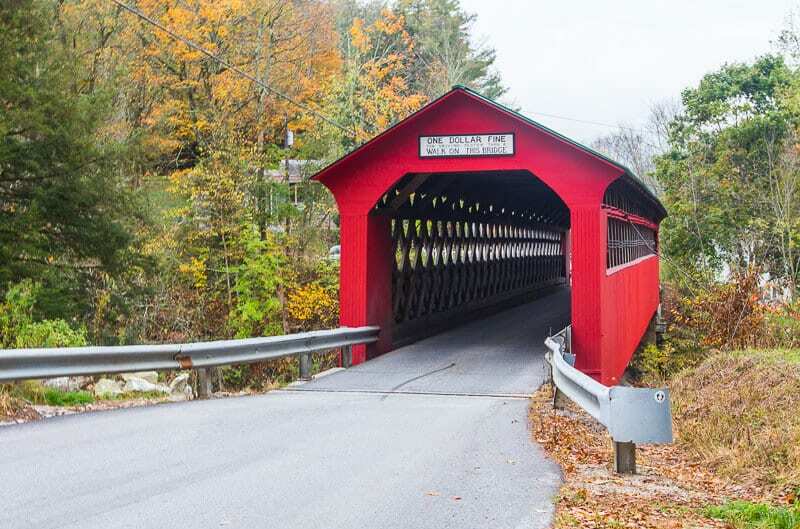 Vermont has more than 100 covered bridges and there are several of them in Southern Vermont. 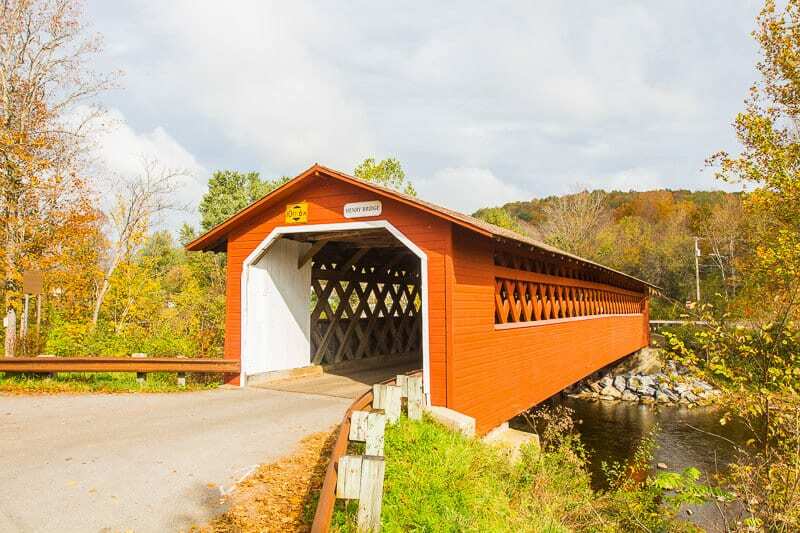 We learned that covered bridges are also called kissing bridges for the lovers who’d linger as they passed through, and we explored five of them from Manchester to Bennington. Spanning the Roaring Branch was our first covered bridge sighting. Slow down so you can see the sign upon entry, and so you don’t get a fine. As the sign says, it’s a $1 fine for driving too fast across it! Two miles from the New York border is the cute West Arlington Bridge which spans the Batten Kill River. Built in 1852, it sits on the National Register of Historic Places and is one of the most known, and photographed in Vermont. Wilmington is a vintage Vermont Village nestled in the mountains and the nearest Vermont skiing destination for major East Coast cities (Mount Snow, Timber Creek and The Hermitage Club at Haystack Mountain). Take a stroll around town with a dozen eateries on offer, we grabbed a bite to eat at Anchor Seafood House & Grille, then nearby there’s miles of woodland hiking trails. From Wilmington, jump on the Vermont Route 100 North and head to Weston. Weston is another one of the cute towns in Vermont and home to Vermont’s oldest professional theater company. 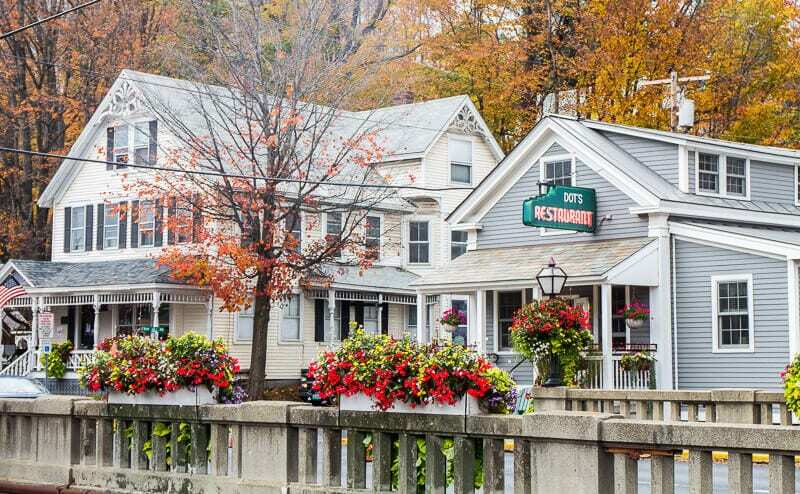 Stop in at the famous Vermont Country Store, an impressive art gallery and the popular Bryant House. We had lunch at Bryant House Restaurant, it’s popular so book ahead or arrive early – we sat at the bar in the 1885 bar room as we were in a hurry. The menu is pure New England fare with classics like Yankee Pot Roast and Chicken Pie. 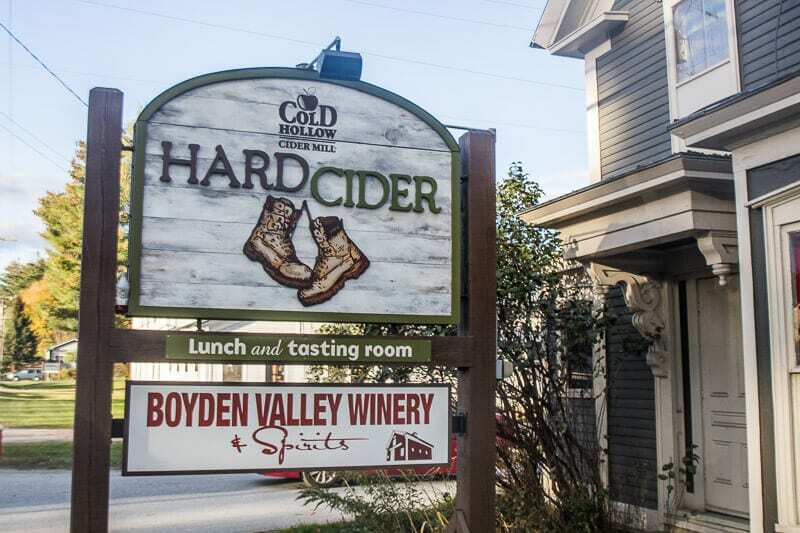 It was at Bryant House that we had our first taste of hot apple cider – a Vermont specialty – absolutely delicious and something we seek out now! 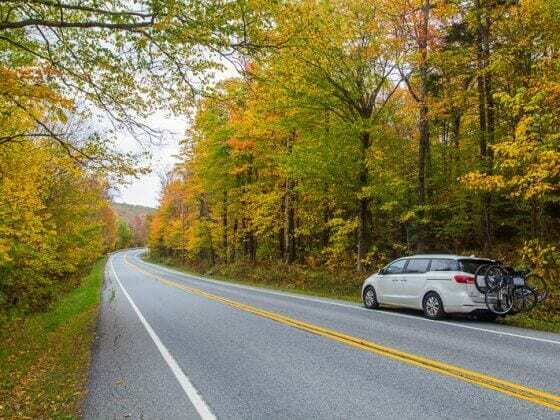 One of the prettiest drives in all of New England is the Vermont Route 100, also known as “Vermont’s Main Street” and “The Skier’s Highway” as it connects some of the best Northeastern winter skiing and riding. Outside of winter there’s great hiking, biking and golf. 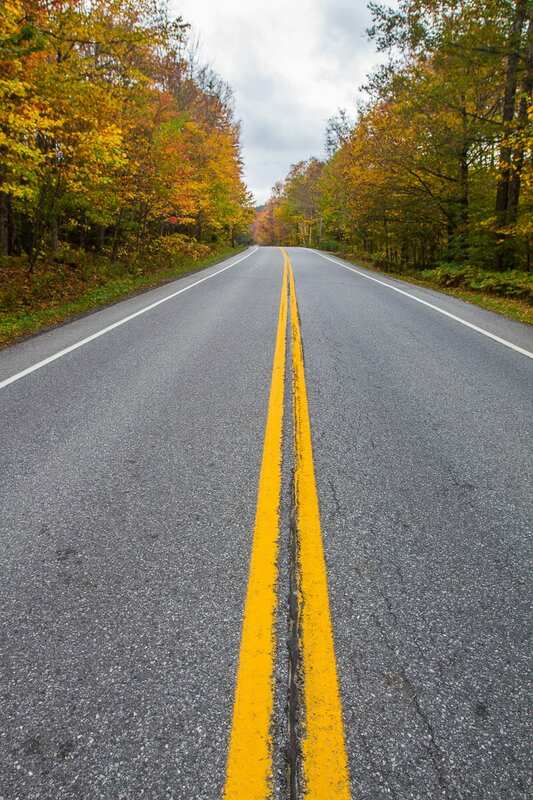 Route 100 Vermont is a North – South state highway running through the center of the state and is 216.59 miles long and is a great way to take in the Vermont fall foliage. Once we left our base in Manchester and finished exploring Southern Vermont, we took this route north to Stowe and the Vermont fall colors were on show. It’s a lovely drive that runs along the eastern edge of the Green Mountains with photographic opportunities along the way. Out of all the places to visit in Vermont, Stowe was our favorite. 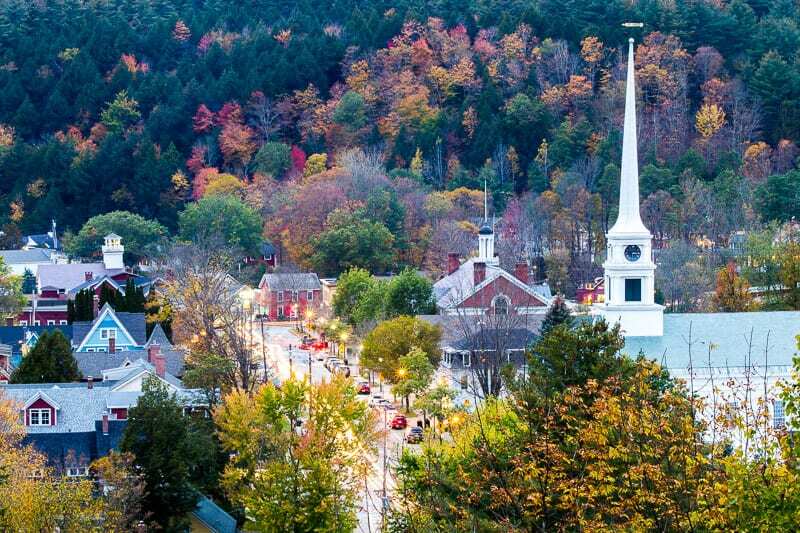 Stowe VT is a charming village in the northern part of the state near Mount Mansfield, the highest peak in Vermont. We spent three nights in Stowe and used it as a base to explore the surrounding region. Around town you have 60+ unique shops and 40+ restaurants, and the church steeples and colonial style houses dusted in snow makes Stowe look like it sprung out from the pages of a children’s Christmas story. Stowe’s proximity to the mountains means it offers endless opportunities to enjoy hiking, biking and skiing adventures. So you can enjoy the outdoors any time of the year! 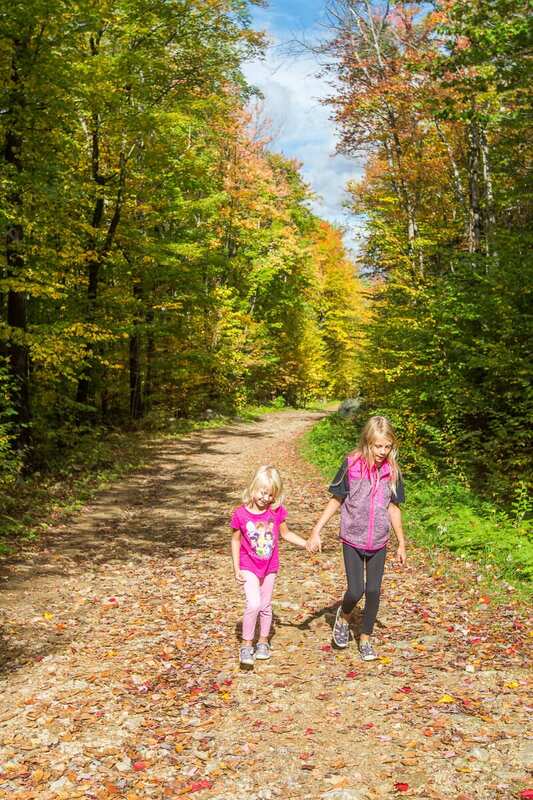 The Stowe Recreation path begins behind the community church in town and winds for 5.5 miles alongside the West Branch River, through forests and open farmland. The trail crosses the creek over wooded bridges at 10 different places, and for us, the fall colors were sparkling. We biked it on a Sunday and enjoyed stopping at the Farmers Market for a shaved ice, a fresh juice and a wander (the markets are only on Sunday). The Alchemist Brewery, across the street, however is closed on a Sunday. I was disappointed we missed the brewery as it is home to the Heady Topper, voted as the best beer in the USA, someone even told us the world, but I think that’s a difficult contest to judge. But just before lunch we cycled past the Idletyme Brewery which has a beautiful outlook onto the path and forest, games of corn hole in the garden out the front, and a beer garden and deck. We stopped for lunch and had a delicious meal plus tasted a new local lemon and ginger cider. I recommend spending half a day cruising along the paved Stowe Recreation Path. The route takes you through spectacular views of the mountain and the chance to experience a little local flavor. Plan time to make stops along the way, and enjoy the exercise! Alternatively, you can walk or roller skate. We saw plenty of joggers and walkers enjoying the scenery and exercise. Put this on your list of fun things to do in Vermont. At the toll road checkpoint at the bottom, the lady told us the 2.8 mile round trip hike up to ‘The Chin,’ otherwise known as the summit of Mount Mansfield, would take an hour and a half…one way. 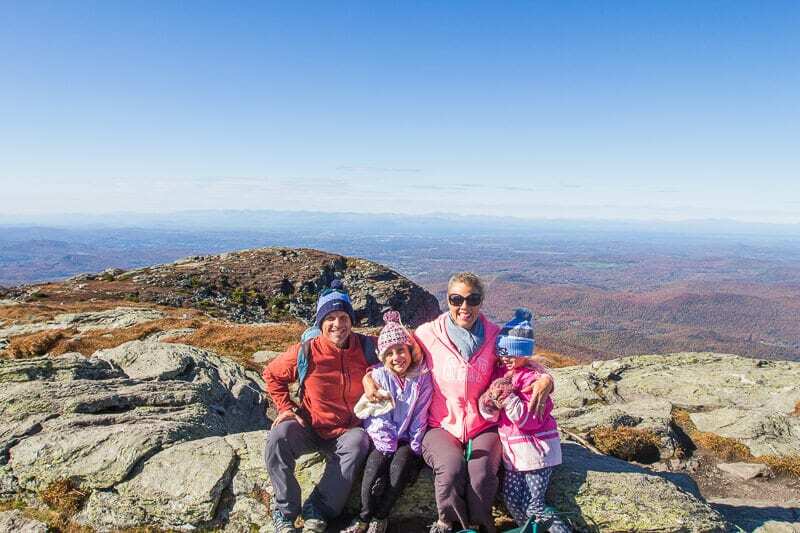 The locals told us that this was one of the best hiking trails in Vermont and one of the best things to do in Stowe with great views over Smuggler’s Notch, the popular ski region of Vermont. We pulled into the car park at ‘The Nose,” the start of the ridge walk. 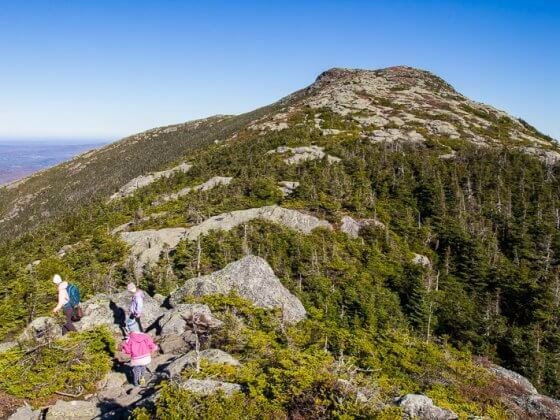 The walk begins through scrubby woods, but quickly opens up to be mostly over the rugged mountain peak with fragile alpine vegetation on either side of the trail. There are views all around of the Green Mountains, Smuggler’s Notch, Lake Champlain and the Adirondack Mountains and even out to Canada. Different trails branch out from the main trail. One leads down to the gondola, which is an alternative way to experience Mt Mansfield. But the Gondola SkyRide does not go to the top of the summit but to a viewing platform below the summit. If you don’t want to hike the trail and just want views then the cost of the gondola is $28 for adults and $19 for children (5-12). I’m glad we decided to complete the ridge walk and at $47 for our family of four to drive up the auto toll road, it was cheaper than taking the gondola. Our girls handled the ridge walk really well. but be prepared for the winds to pick up the closer you get to the summit. If you know Ben & Jerry’s Ice Cream, you know it’s not the cheapest ice cream going around but like most things you pay for what you get. 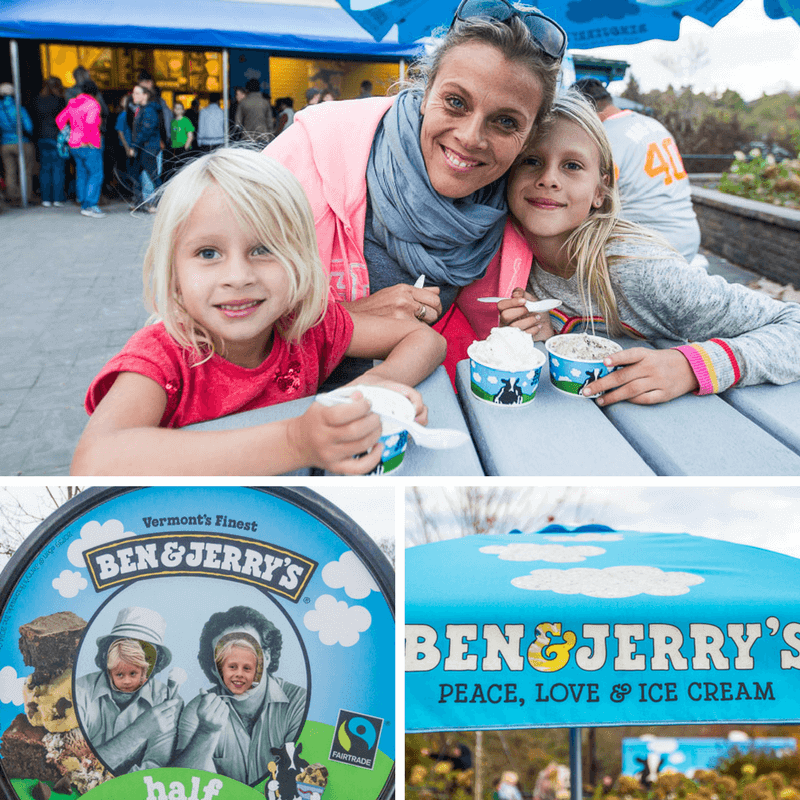 One experience our kids really looked forward to on this road trip was the chance to visit the home of Ben & Jerry’s in Waterbury, just 15 minutes from Stowe. Here you can learn all about the story of Ben & Jerry’s. 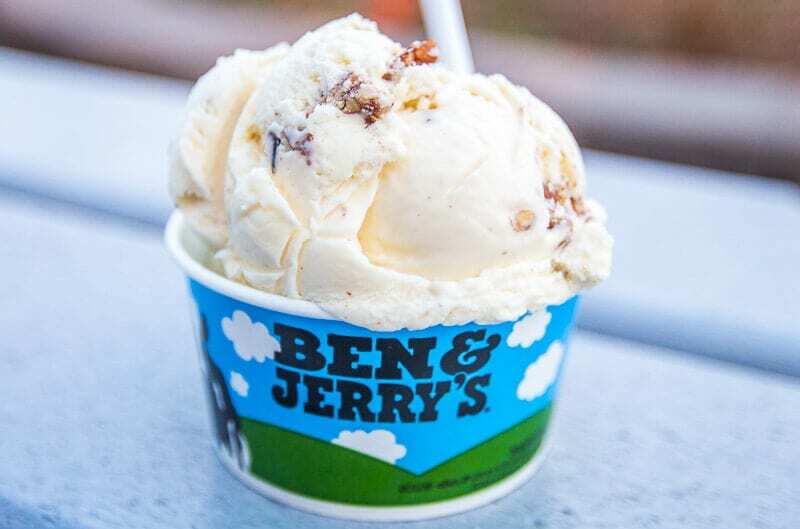 With a $5 correspondence course in ice cream-making from Penn State and a $12,000 investment, Ben and Jerry opened their first ice cream scoop shop in a renovated gas station in Burlington in 1978. You can take a 30-minute guided factory tour and learn how they make ice cream and how they put their values into action at every step of the process. Plus, you can enjoy your favorite flavor at their full-service Scoop Shop. It was busy and definitely one of the most popular Vermont attractions. Now that we follow a gluten free diet, we’ve been drinking plenty of cider on our US travels, and the cider in Vermont is the best so far. 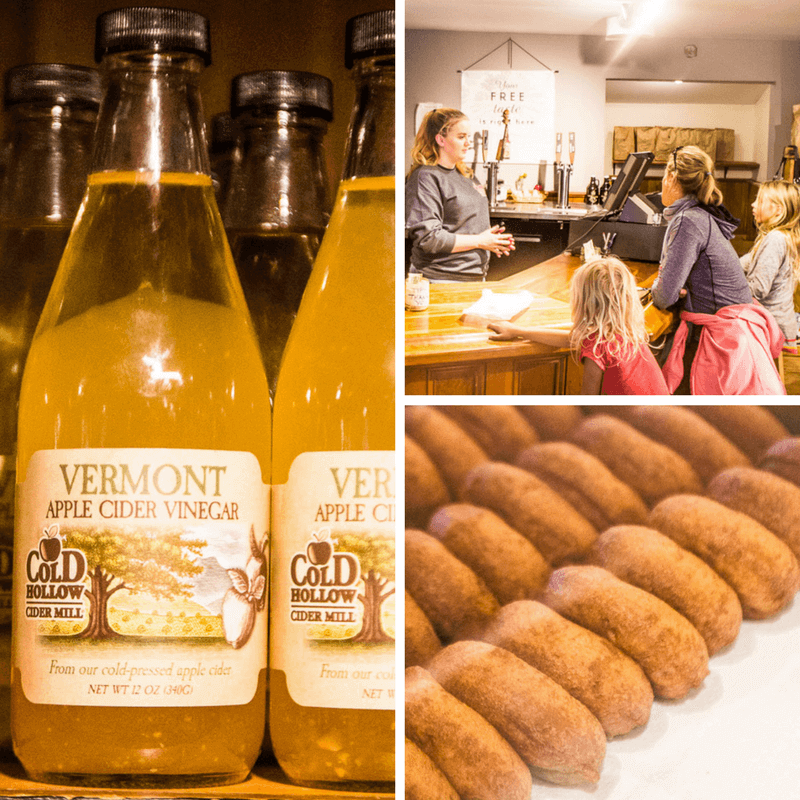 The Cold Hollow Cider Mill is one of Vermont’s most popular tourist attractions, and they are a top New England producer of fresh apple cider. Here at the mill they do it the old-fashioned way, making pure cider with a traditional rack and cloth press built in the 1920s. Explore the vintage mill and see cider being made, then sample jellies and mustards. And in the bakery section they make their legendary Cider Donuts — called one of the country’s four best donuts by Gourmetmagazine — every day, fresh all day long. Also featured are Pumpkin Rolls, Mapled Nutty Bars, Apple Turnovers, Homemade Fudge and good old Apple Pie. 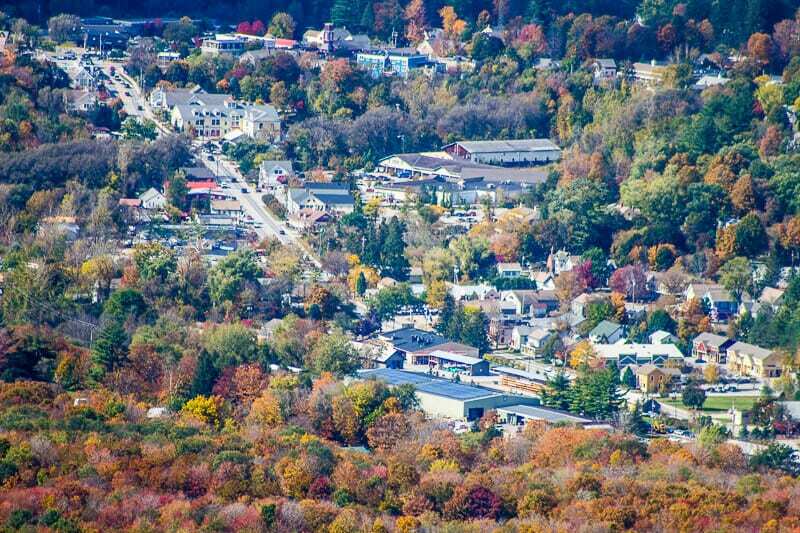 For a lovely elevated view of Stowe Village, head up to Sunset Rock, located in the heart of Stowe’s historic village. To get their on foot, the trail up begins at the end of Sunset Street and takes less than an hour to complete the round trip. 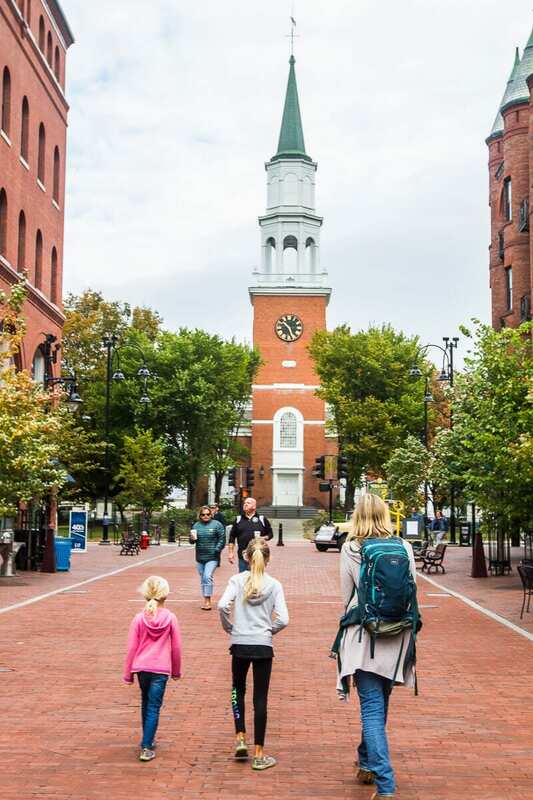 Burlington is the biggest of the Vermont cities and home to the University of Vermont. 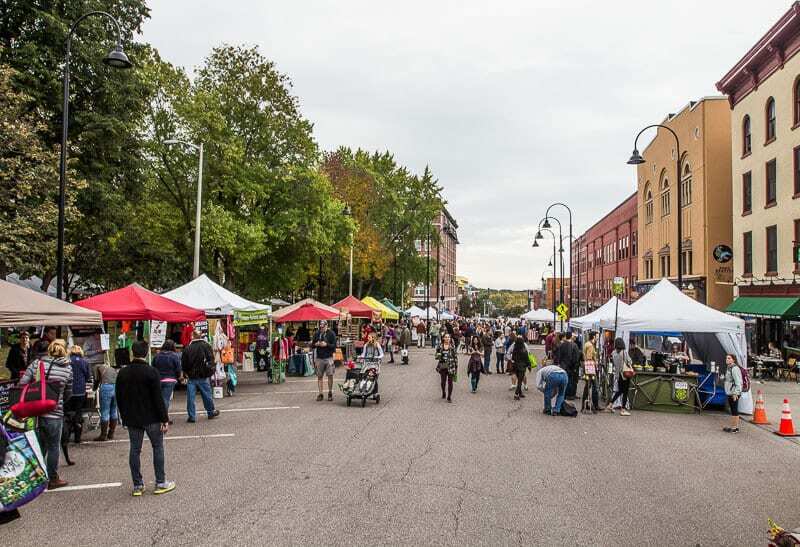 There’s a thriving arts scene, good shopping, and a range of outdoor activities in all four seasons due to its location beside beautiful Lake Champlain and the surrounding mountains. 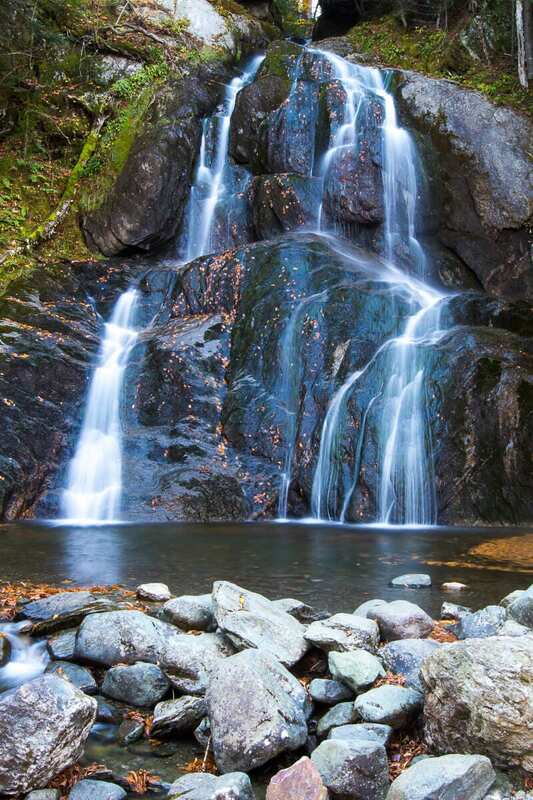 Burlington is only a 50-minute drive from Stowe which enabled us to make an easy day trip. 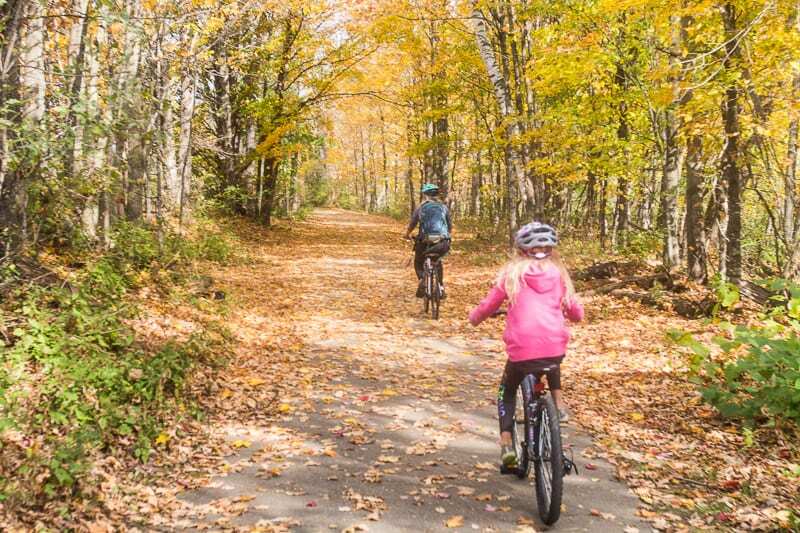 Our favorite thing to do was cycle the Burlington Bike Path that runs along the Lake Champlain shoreline. 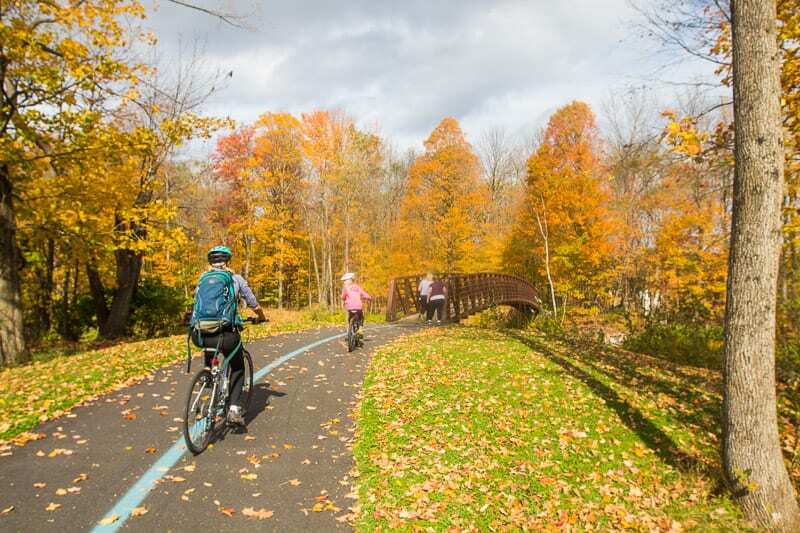 It’s an 8 mile paved path popular for cyclists, runners and walkers, especially during summer, fall and spring, but the truly dedicated even get out there in winter. We didn’t do the whole path, but being mostly flat and paved this was an easy ride for our kids, with playgrounds and food places to stop at along the path for a rest. One place we stopped in at was Foam Brewers for a drink, an historic brick building in a great location along the Burlington waterfront. Take a stroll along Church Street Marketplace, the outdoor pedestrian shopping and dining mall which takes up four blocks of Church Street between Main and Pearl Streets. There’s ample restaurants, cafes, and stores to look in, and historic buildings ranging in style from Victorian to Art Deco. For great coffee, we walked around the corner onto Main Street to the locals fave Muddy Waters cafe. If you’re in town on a Saturday, the Burlington Farmers Market is popular with locals and visitors. Moe than 90 stands are set up in downtown Burlington’s City Hall Park, just off of the Church Street Marketplace offering seasonal produce, artisan wares, and more. I hope this post gave you some ideas and helped with your travel planning to visit Vermont. It’s a gorgeous state and easy to get around in a short amount of time. 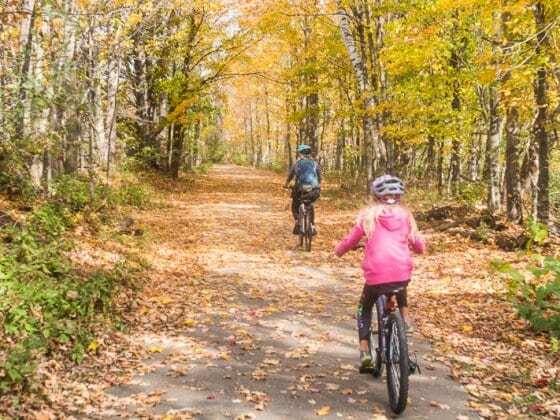 So whether you’re looking for a one week or longer Vermont vacation as part of your New England road trip, this state is typically one of the best places to visit in the fall. But I am interested in coming back in the summer, and maybe even winter, brrr. Booking.com has over 600 properties in Vermont. You get free cancellation on most rooms and a best price guarantee. Can you share any Vermont travel trips? What do you think are the best places to visit in Vermont? Share in the comments. Wow! Such an in-depth guide. Thanks for sharing it. 🙂 Hopefully, I’ll visit it soon. Bookmarking it right away. a day out but thanks for the warning about the string winds! I’ll be on alert. Thanks again for the interesting read! No I think that will work as long as you’re okay with moving often. Both places have different things to offer. We preferred Stowe to Burlington but they are both good. What weeks were you in Vermont last year? Thats a great write up. Thank you very much . Are there any such attractions during winter. Planning to visit Vermon this xmas. We have two boys aged 8 and 3.
it was a long post but full of good information and beautiful photos. thanks for sharing.